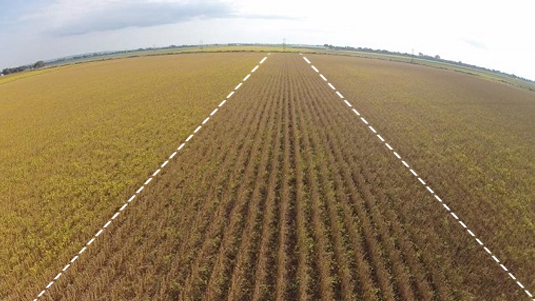 Quadris Top® SBX fungicide offers soybean growers the most robust formulation for broad-spectrum preventive and curative disease control. 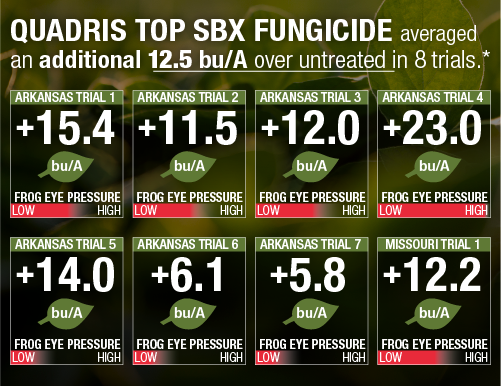 Controlling many diseases including strobilurin-resistant frogeye leaf spot, Quadris Top SBX brings outstanding disease control and stress management to help boost yield and profit potential. 1. Quadris Top SBX protects against diseases including anthracnose diseases, brown spot, rust, powdery mildew, frogeye leaf spot (susceptible and resistant strains). 2. Two active ingredients, azoxystrobin and difenoconazole, and two modes of action provide optimal disease control and resistance management. 3. Quadris Top SBX offers superior stress management benefits and promotes plant growth. Photos are either the property of Syngenta or used under agreement. Besiege and Endigo ZC are Restricted Use Pesticides. Besiege and Endigo ZC are highly toxic to bees exposed to direct treatment on blooming crops and weeds. Do not apply these products or allow them to drift onto blooming plants while bees are foraging adjacent to the treatment area. Besiege®, Endigo®, Quadris Top®, the Alliance Frame and the Syngenta logo are trademarks of a Syngenta Group Company. Aproach® is a trademark of DuPont. Priaxor® is a trademark of BASF.